For this month's "Maps Of The Month" featurette, I wish to draw your attention to Trebor Almasy's Virtual Boy Wario Land (Virtual Boy) maps. The colour red and things beginning with the letter "V" are celebrated this month, but we'll ironically look at one of the least loved Nintendo gaming systems - the Virtual Boy. With an eye-searing red palette and only a dozen games, it's often chalked up as one of the things Nintendo regrets releasing. But that's not to say there aren't some gems in its limited library. One of those gems is Virtual Boy Wario Land. The gameplay resembles the Wario Land games previously released on the Game Boy, but now there is the added third dimension. Well, it's not really a 3D game, more like a 2D game with extra layers, enhanced with the magic of the Virtual Boy's stereoscopic screens. Beware of objects and enemies in the background that may come forward and become obstacles and threats to Wario's quest to get rich - again. Trebor Almasy does away with rose-tinted glasses, so to speak, to give us maps that aren't quite as crimson-hued. Despite the image you see above, his maps aren't redscale, they're actually greyscale, with objects of interest highlighted with colour (and not limited to red). It's certainly a neat method into making maps easier to read (especially if you're actually using them during play and your vision is distorted because you've been ignoring the Virtual Boy's suggestions to take breaks every few minutes). It's nice to not always have to be seeing red. 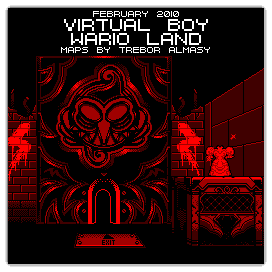 So to recognize the effort put into making these lovely maps, and actually showing some love for Nintendo's red-hued stepchild, Trebor Almasy's Virtual Boy Wario Land maps will be known as VGMaps.com's Maps Of The Month for February 2010.